PIA Training center Karachi and Quetta starts taking admission applications for the program of Aircraft maintenance engineering course, the two years program will be highly motivated. 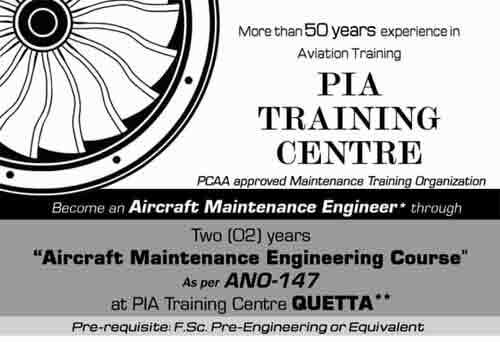 PIA Training centre have more than 50 years’ experience in aviation training and PCAA is approved maintenance training organization. It’s a wonderful opportunity who want to become aircraft maintenance engineer can apply today for two years program. pre requisite FSC pre engineering or equivalent. On completion of training only 2 years maintenance experience will be required for PCAA Basic license. Theoretical training will be conducted at Quetta center: however practical training duration approximately 1 year will be conducted at PIA Training center Karachi only. Accommodation / transportation will not be provided by PIA Training center. You can also download admission form from piac.com.pk pia training folder.